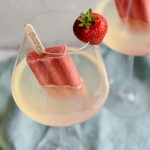 You new favorite summer cocktail recipe will be this champagne lemonade with a twist – it’s a poptail (aka an alcoholic ice pop cocktail recipe) garnished with a strawberry fruit bar! Imagine, you’re looking for a cool cocktail to enjoy on a hot summer night with some friends. You want something that’s easy to make, but doesn’t involve a millions steps or a lot of prep. Champagne lemonade is just that. 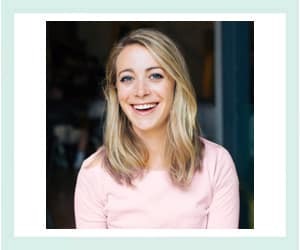 It’s so easy I’m not sure you can even call it a recipe. You still want to impress your friends though, and make the night memorable, no matter how casual it is. Read on for the recipe and step-by-step instructions! That’s where the poptail comes in. 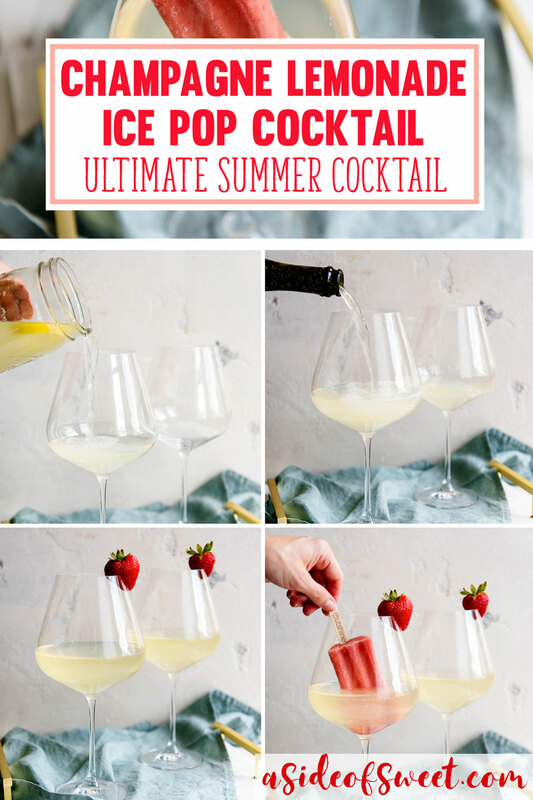 If you’re wondering what a poptail is, it’s a cocktail recipe that is garnished with an ice pop or frozen fruit bar. You may remember seeing one on A Side of Sweet last summer. They’re my favorite way to add a little pizzaz to a drink. 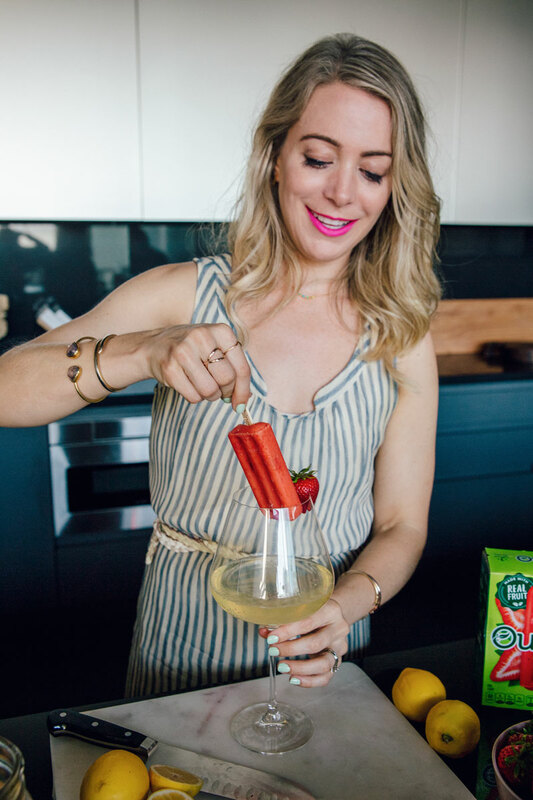 When I’m not making my own ice pops, my treat of choice is Outshine Fruit Bars. 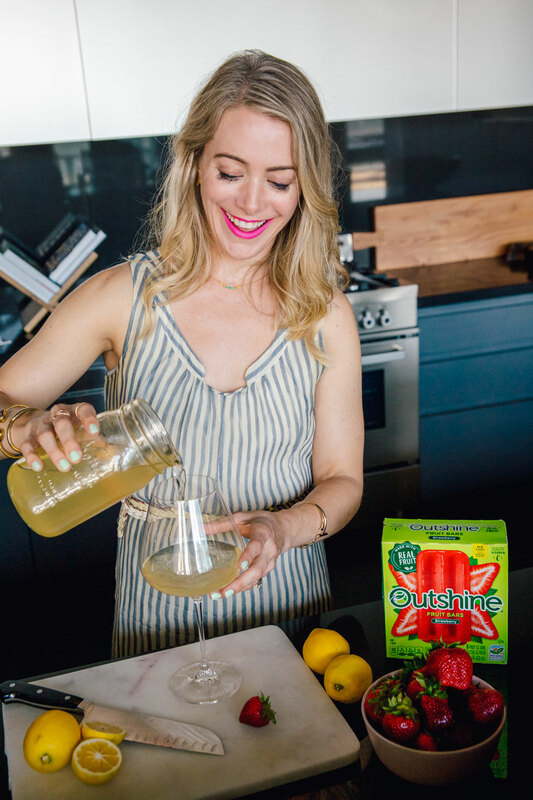 Not only are they a great healthy snack, they also add a refreshing twist to your favorite cocktail recipe. 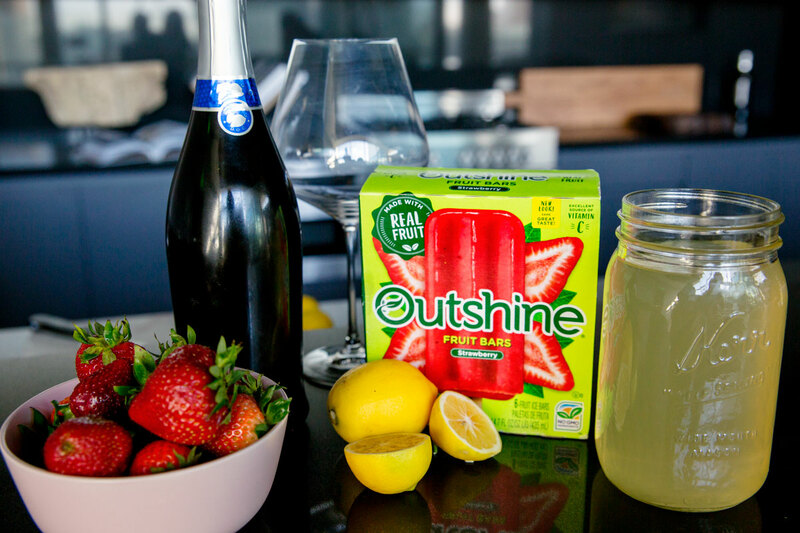 Outshine fruit bars are a million times better than your typical frozen snack. This isn’t a “from concentrate” situation. The first ingredient on the label is real fruit. You can taste the bits of strawberry in every bite! Simple but delicious. You can find Outshine fruit bars at Safeway. I keep almost every flavor on hand at all times. I’ve actually turned our ice maker into a holder for them, because…priorities. Right now you can save $2 when you buy 3 or more Outshine or other Nestlé ice cream products. Get the offer here. There are so many great things about this recipe, including how easy it is to put together and the fact that the ingredients are all easy to find. You don’t have to hunt for any speciality ingredients or buy obscure bottles of liquor. Start by pouring lemonade into a large glass, like a wine glass. 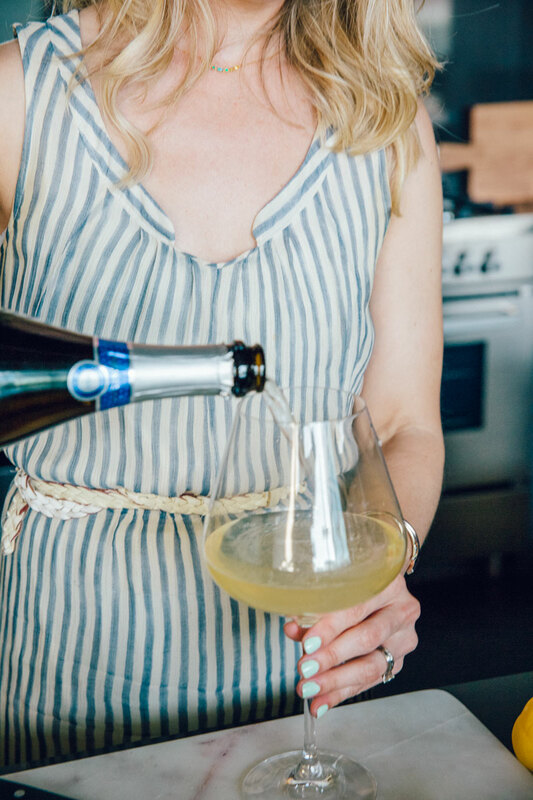 Carefully open a bottle of champagne, prosecco or sparkling wine. 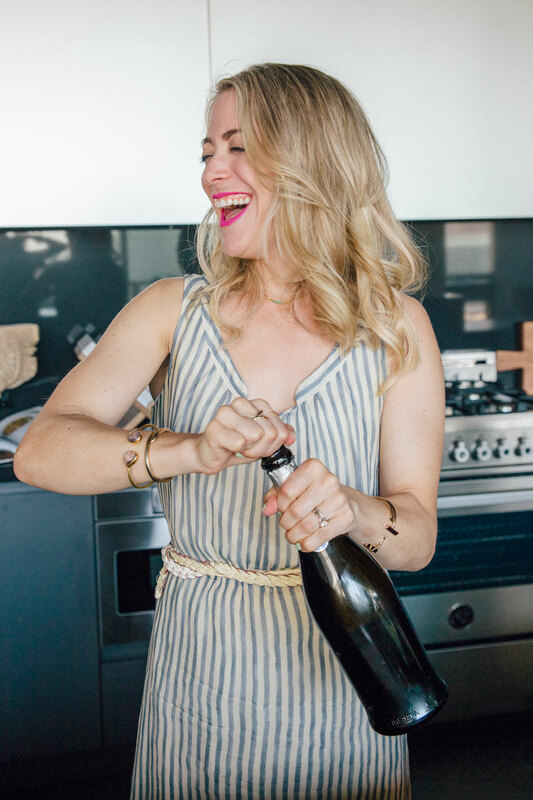 This is my I’m-opening-champagne-and-don’t-want-to-blast-my-eyeball-out face. I know you were wondering. 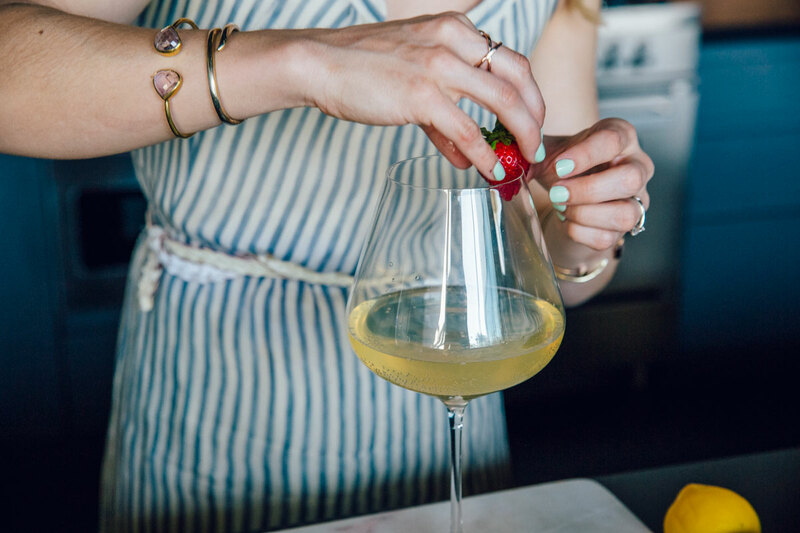 Add champagne to your glass and garnish with a fresh strawberry. Now you’re ready to add your Outshine Fruit Bar and enjoy! 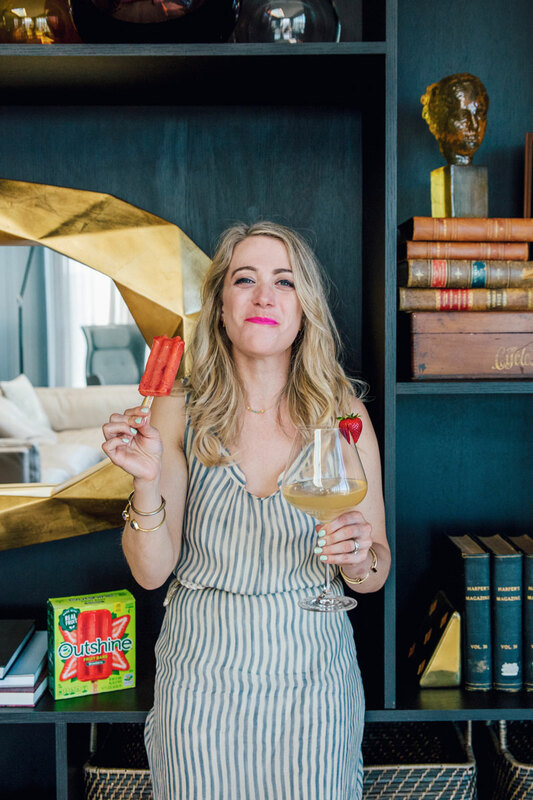 Adding a frozen fruit bar instantly makes it the ultimate summer cocktail. No fancy ingredients to buy or track down. Just a few steps and no measuring required. It’s refreshing and delicious – the perfect mix of tart and sweet. As the Outshine Fruit Bar melts you’ll get pieces of real fruit mixed in to the cocktail. Switch things up and use the frozen fruit bar flavor of your choice. Make an easy non-alcoholic mocktail version of this cocktail by using sparkling water instead of champagne. 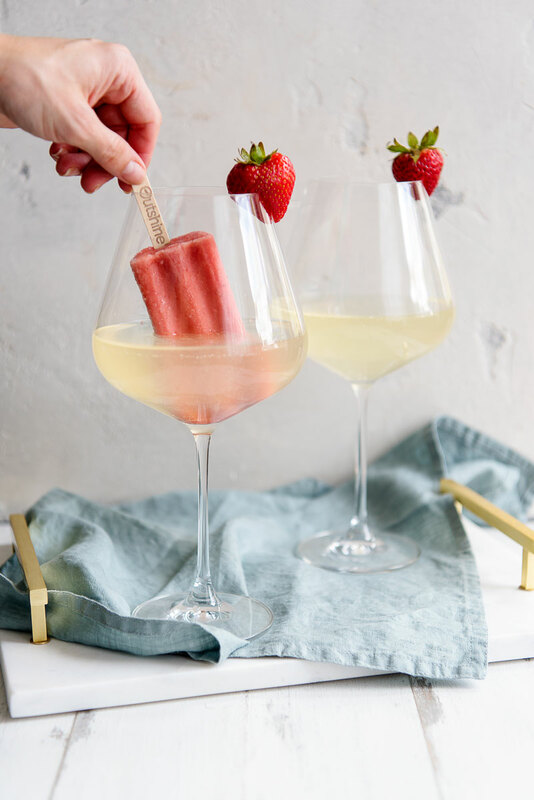 In just a few steps you’ll have the perfect summer cocktail recipe – a refreshing champagne lemonade with a fun twist – it’s garnished with a popsicle! Fill large glass with lemonade and champagne. Garnish with a strawberry and add your strawberry fruit bar. *For a non-alcoholic mocktail version, try using sparkling water like Perrier or San Pellegrino instead of champagne. **Strawberry is just a suggestion! You can use the fruit bar flavor of your choice for this recipe. 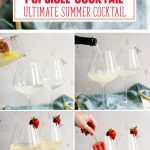 Are you craving a cool Champagne Lemonade Cocktail? Pin this recipe for later! This post is sponsored by Outshine Snacks. All opinions and recipes are my own. Right now you can save $2 when you buy 3 or more Outshine or other Nestlé ice cream products. Thanks for supporting the sponsors that allow me to bring you beautiful – and delicious – content! The coupon link doesn’t work. I’m so sorry about that Beth! I am working to get this fixed. 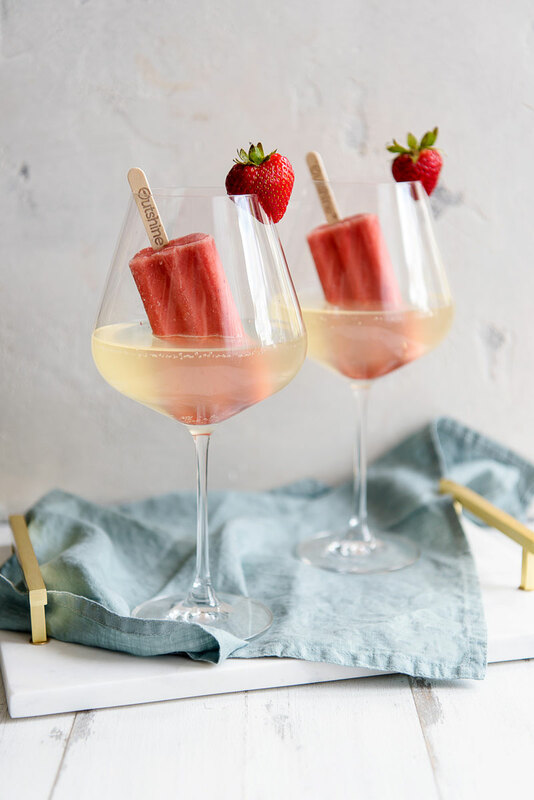 I like the idea of adding a popsicle but do I have to use champagne? Also I just clicked the coupon link and it doesn’t work. I’m so sorry! I’m working to get the link fixed! Hi Ruth! You do not have to use champagne. 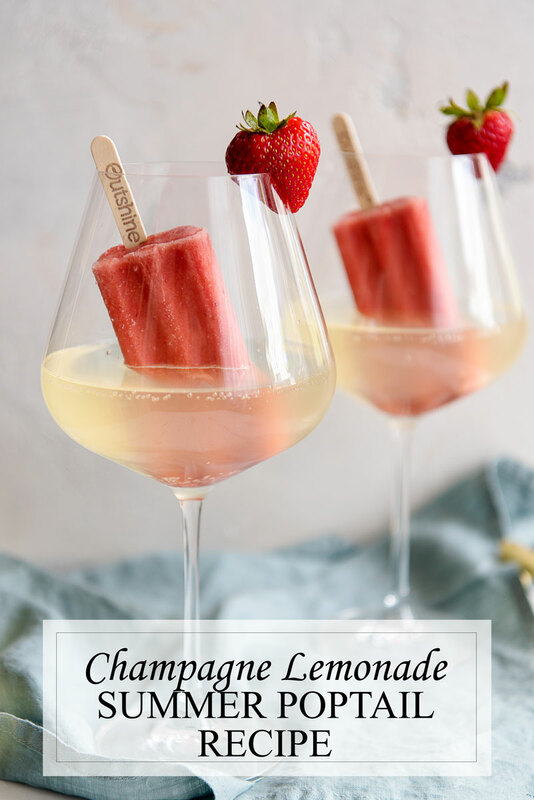 You can use any sparkling wine or prosecco or even use lemonade if you want a non-alcoholic version! Oh my goodness! These look so good and so refreshing! I promise they are! I hope you get a chance to make them!